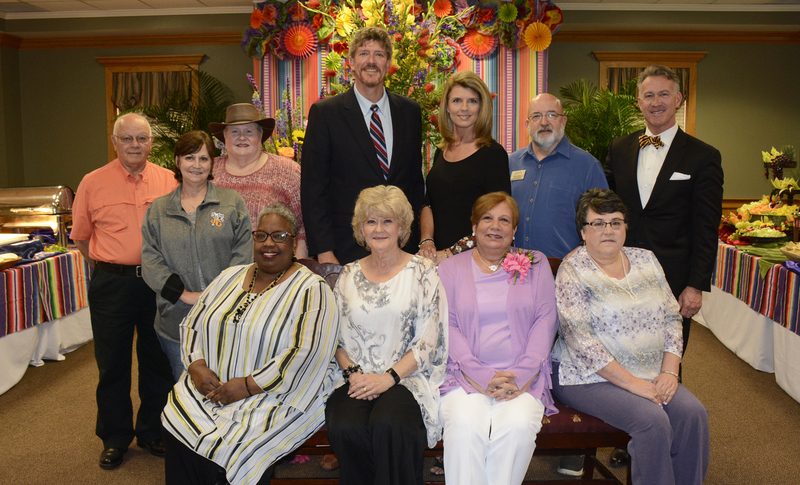 ELLISVILLE – Jones College held its annual “Retirement Tea” for eleven employees retiring in May. When combined, these employees provided 193 years of service to JC, with some having additional years of service working at other educational institutions. 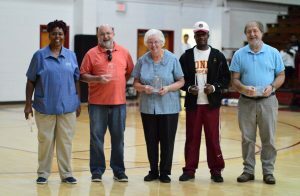 The 2019 retirees include Betty, or “B.J.” Meche. 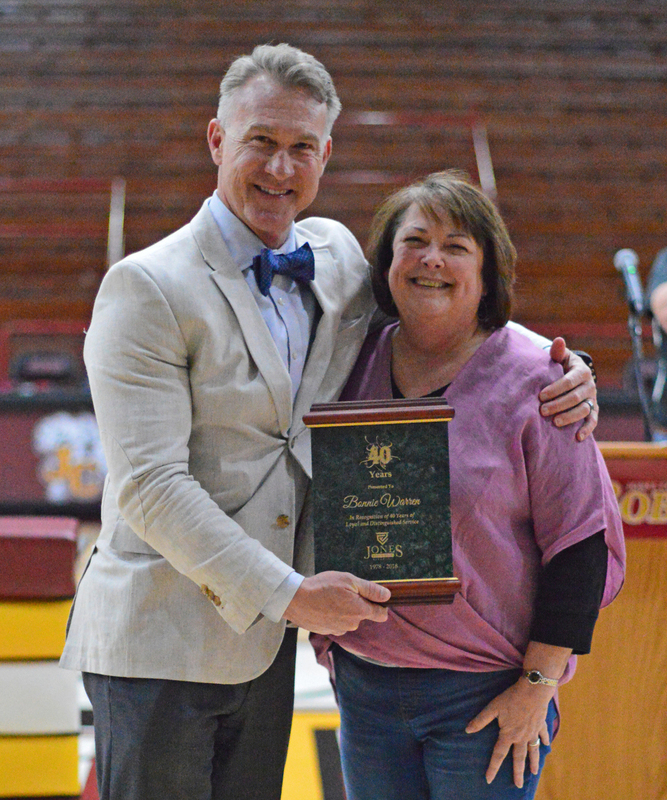 She worked in various roles at the campus bookstore for the last 35 years. For the last 19 years, Rick Bedwell has taught business courses and has served as the division chair of the department. Angela Cooley finishes 25 years of teaching math at Jones. Dianne Johnson has been teaching business office technology for the last 21 years. 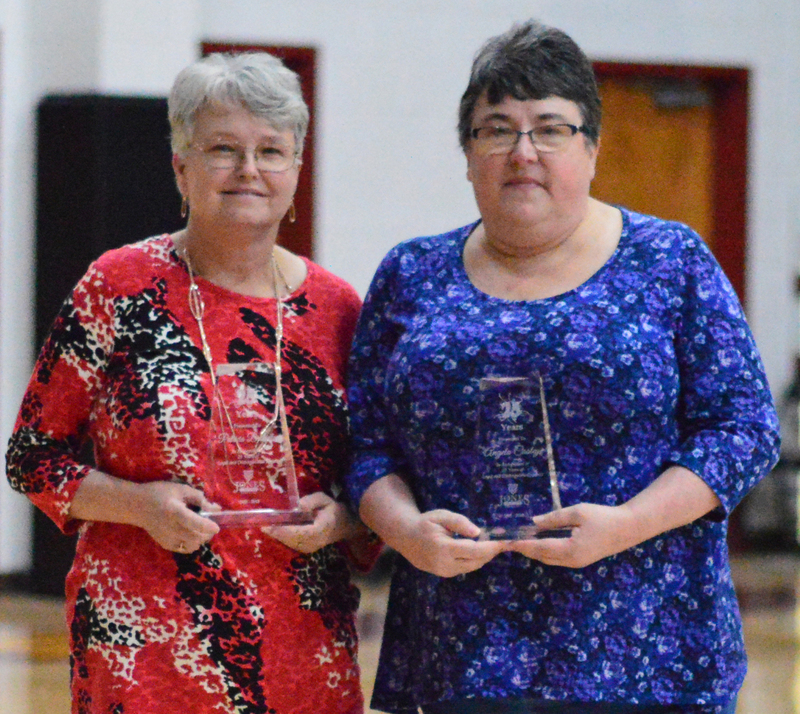 Two employees, Assistant Dean of Student Affairs, Mark Easley and former coach, and practical nursing secretary, Pat McMichael have served JC for 20 years each. Gloria Newell has served as the assistant culinary arts instructor for the past 16 years. The Financial Aid Office is saying its farewells to Mary Kuhn after working 13 years in that department. Nine years ago, Mickey Ciullo began working in the campus bookstore while Gerald Griffin has completed seven years in the transportation department. English instructor, Rhonda Farrior is retiring after teaching for six years at JC. ELLISVILLE – Sixty Jones College faculty and staff members were recently honored for their years of service to the college. Administrators and the JC Foundation treated everyone to lunch and an afternoon of basketball. 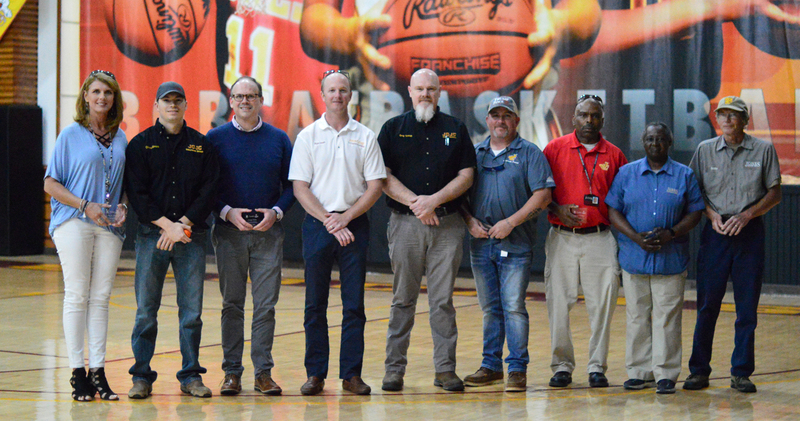 JC administrators honored employees for their service at five-year increments, beginning with those who have served at least five years. 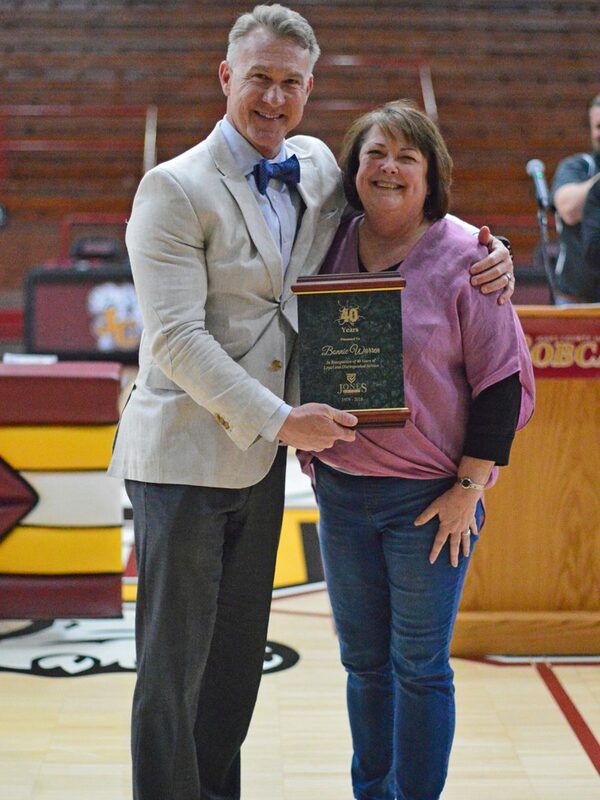 Former JC Athletic Director, Katie Herrington, celebrated 30-years with Jones. 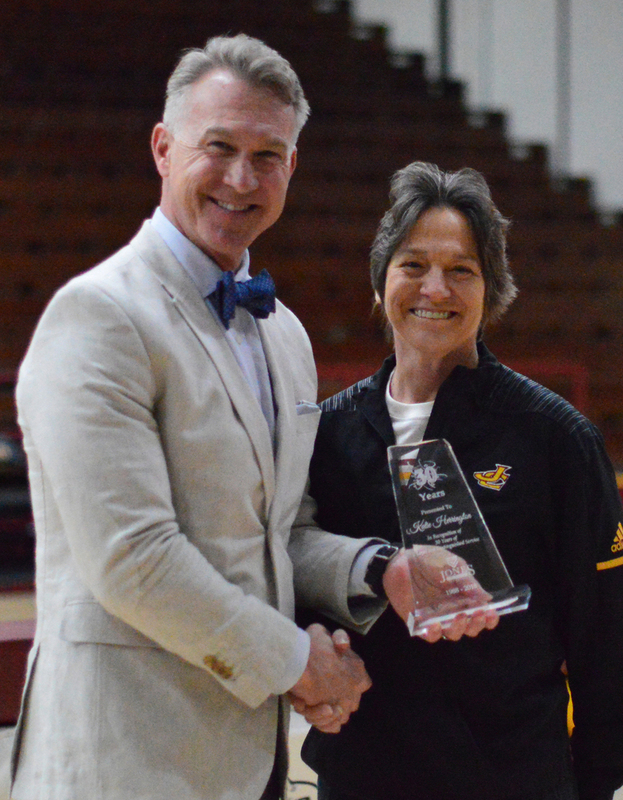 Herrington has been a part of the athletic department in various roles. She has served as the Region XXIII Women’s Director and in other roles, for more than 25 years. At Jones, Herrington served as the head basketball coach of the Lady Bobcats for 11 years and she has taught health and P.E. classes for the past 19 years. 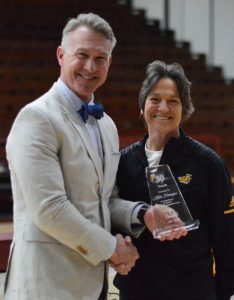 The Smith County native retired from being Athle tic Director after 12 years, but she continues to serve as Division Chair of the Health, Physical Education and Recreation department. Serving the college for 25 years, are Angela Cooley-math instructor; Patricia Brownlee-childcare teacher & women’s housing; Stacy Ruth-sociology instructor. Eight JC employees were recognized for their 20 years of service: Michael Boyd-guitar/music instructor; Rick Bedwell-business division chair; Rick Hamilton-VP of enrollment management; Marilyn Long-campus operations/duplicating; Corey Jones-math division chair; Kenneth Cummings-A.D. nursing instructor; Diasetta Nelson-housekeeping and Pamela Brownlee-WIOA Win Job Center. Celebrating 15 years of employment at JC were Stan Lewis-electrical technology instructor; Gloria Newell-culinary arts instructor; Karen Purvis-student affairs; Lee Graham-JC Foundation; Latasha Peters-financial aid; Matthew Burnham-science instructor; Kevin Kuhn-bookstore; Shannon Wilks-workforce college; Kathryn Davis-social science instructor; Amanda McLeod-Asst. VP of enrollment management; Lauren Bell-A.D. nursing instructor; Joel Cain-Athletic Director; Missie Meeks-English instructor; Jessica Bunch-math instructor; Terry White-math instructor; Anna Brashier-nutrition instructor; Joanna Cooley-speech instructor and David Clark-workforce college. Twelve JC employees were recognized for their 10 years of service including Gabe Mercier-I.T. ; Caleb Smith-workforce college; Crystal Nail-external funding-grants; Lisa Purdum-marketing; Jody Buchanan-Clarke County Center director; Jennifer Wood-financial aid; Amy Myers-practical nursing; Fawn Shoemake-instructional affairs; Sabrina Smith-enrollment management; Cynthia May-practical nursing; Rochelle Dahmer-English instructor and Ricky Gaddy-maintenance. After five years of employment at Jones, these sixteen employees were honored for their service: Joshua Oubre-culinary arts; Jimmie Freeman-maintenance; Ashley Adams-groundskeeper; Greg Griffith-electro-mechanical technology instructor; Christina Nixon-childcare; Lakin Craft-one card services; Ryan Hearn-civil engineering instructor; Mark Walters-biology instructor; Tim Morris-speech instructor; Chase Elmore-precision machining and manufacturing instructor; Rhonda Farrior-English instructor; Tommy Freeman-maintenance; Herbert Windham-housekeeping; Susie Polk-housekeeping; Darren McCraw-campus police and Bobby Dykes-groundskeeper. Each honored employee was given a special item designed for each level of achievement: 5 years-small plaque; 10 years-large plaque; 15 years-clock; 20 years-small acrylic trophy; 25 years-medium acrylic trophy; 30 years-large acrylic trophy and an extra-large plaque for 40 years. ELLISVILLE–Six Smith County students were recently awarded the Jones County Junior College A.T. Bassett Memorial Scholarship. 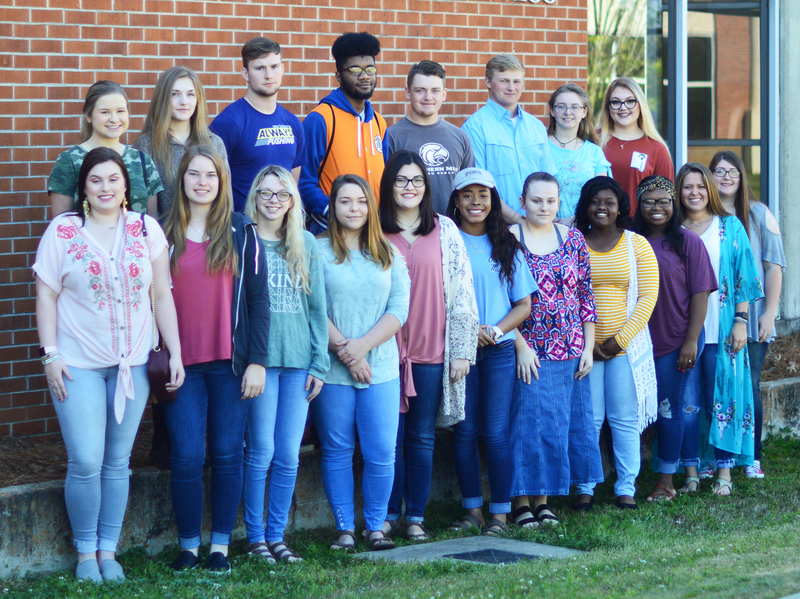 English teachers from the three Smith County schools were asked to choose several students to compete by writing an essay on various topics for the Writing Competition facilitated by JCJC’s English department. Nineteen students competed for the A.T. Bassett Memorial Scholarship with first and second place winners earning tuition scholarships. The A.T. Bassett Scholarship was established in memory of A.T. Bassett by his wife Sue and daughters, Lona Bassett and Morrett Ellzey of Moselle. 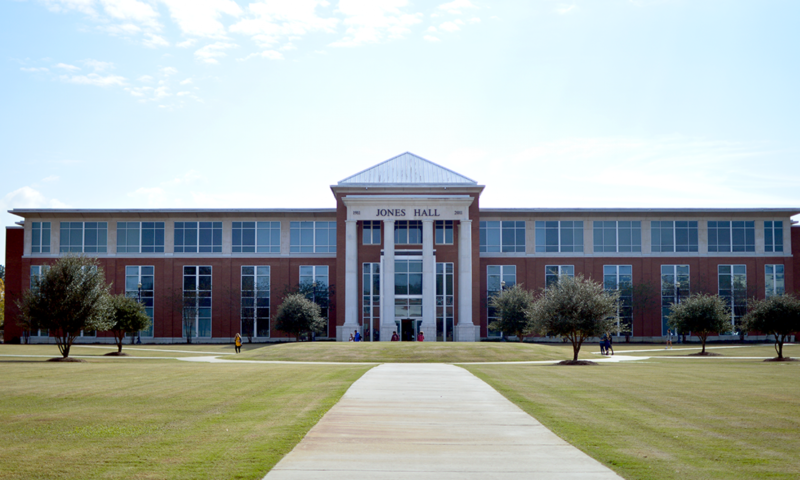 ELLISVILLE –Five Jones College sophomores were selected for the highest honor bestowed upon students, being named Tullos Scholars. 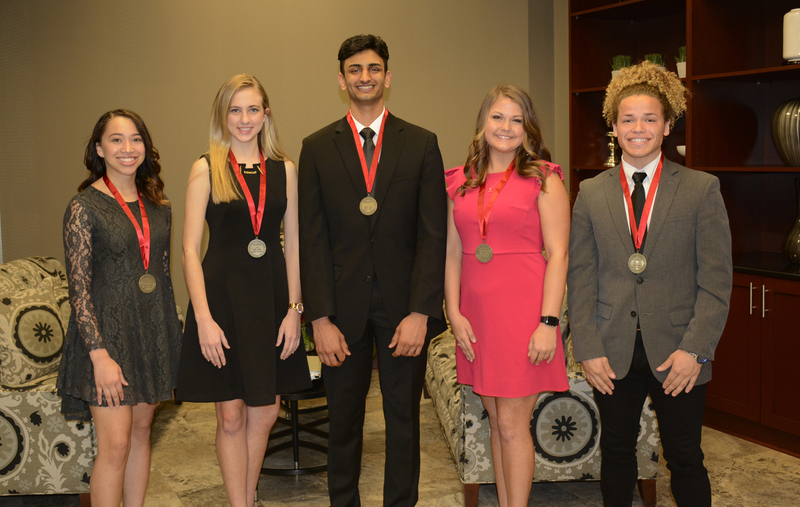 These students, Madeline Collins-Heidelberg; Shivum Desai-Oak Grove; Anna Catherine Hampton-Petal; Je’Shaiah Stephens-Laurel and Jared Woullard-Leakesville have distinguished themselves through their academic achievements and service to others according to Assistant VP of Instructional Affairs, Julie Atwood. “Recognized by both faculty and administrators of Jones for their outstanding achievement, each of these students is highly regarded for their activities both inside the classroom and in the community. It is truly a privilege to work with this group, and I look forward to seeing what the future will hold for each student,” said Atwood. All five Jones students are members of the international honor society, Phi Theta Kappa and were nominated by faculty to apply for the Tullos Scholarship at the end of their freshmen year. Requirements for the scholarship include being a full-time sophomore, submitting a résumé with two-faculty recommendation letters, having outstanding academic achievements, being engaged in college activities, leadership positions and participating in community service. Each student was honored recently, where they received medallions and $1,000 scholarships in recognition of being named after the scholarship donors, Gene and Nada Tullos. JC President, Dr. Jesse Smith shared with guests and the newly selected Tullos Scholars, Gene Tullos came to Jones on a basketball scholarship which he said, gave him a jumpstart and a great foundation to begin Law School. Endowing scholarships, like the Tullos Scholarship Program, was his way of returning the “favor” to the college that provided an excellent foundation for a successful career as an attorney in Smith County. Tullos is also credited with trying more than 500 civil cases with some of the largest damages awarded and for establishing a war memorial listing all of the veterans in Smith County. The historian and accomplished attorney, Tullos said he felt unsure how he’d do as he began his college education, much like the newly recognized Tullos Scholar, Madeline Collins. As a homeschooled student, Collins said she was unsure of how she’d do in the classroom for the first time. However, she quickly set high academic goals as a freshman at Jones and became more confident in her abilities. The future CPA has served as the Secretary/Treasurer for the Student Government Association and as an English tutor, while also participating in the English honor society, Sigma Kappa Delta, the Engineering Society Club and in intramural sports. 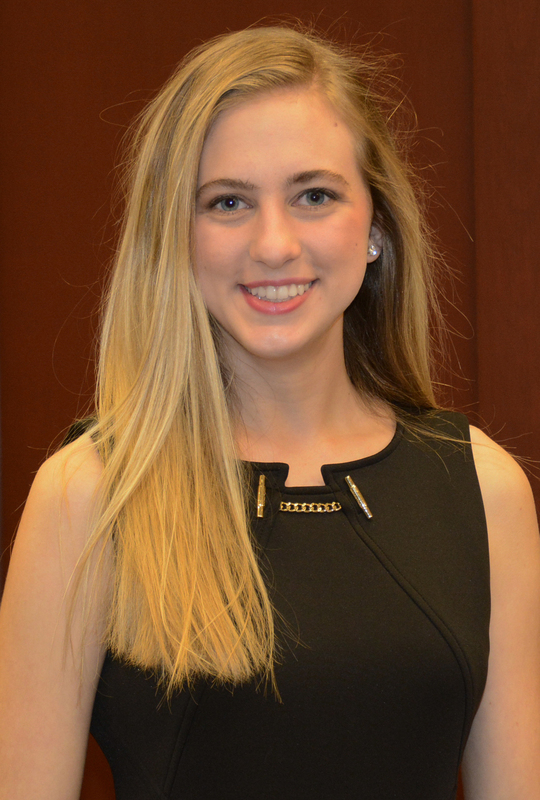 She was also voted as Sophomore Maid for Homecoming Court and is a member of the Hall of Fame. “As I set and accomplished more goals, I grew as a student. Having this honor bestowed upon me helped me to realize that I have gone above what was expected of me. I didn’t realize how huge of an honor this was until I was surrounded by the other scholars and they are all people I greatly look up to and are inspired by,” said Collins. Additionally, Collins also works on her family’s pig farm, volunteers as the pianist at United Methodist Church, while also working at Chik-fil-A in Laurel. One of the Tullos award recipients Collins said she looks up to, literally, is biological sciences major, Shivum Desai. The former native of England plans to become an invasive cardiologist and has worked tirelessly serving the college and his community in pursuit of that goal. 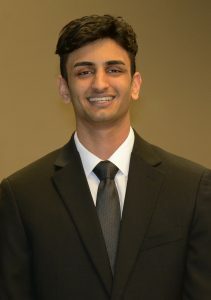 Desai has served as the president of Phi Theta Kappa honor society, is a member of SGA, College Democrats, Phi Beta Lambda business honor society and has volunteered for several campus events. He has been selected as the HEADWAE student representative for Jones, Hall of Fame, Letter “J”, PTK’s Golden Key Award, and Coca-Cola Gold Scholar, and he is nominated for the All-MS Community College Team. Desai can also be found volunteering at area hospitals, the ARC and the Pro ACT Learning Center and he is the assistant manager at Baskin Robbins in Hattiesburg. Being named a Tullos Scholar is humbling to the Oak Grove graduate. Receiving the Tullos Scholars scholarship relieved some of Jared Woullard’s financial burdens. The mechanical engineering major said he didn’t think he’d have the opportunity to go to college, despite his accomplishments in high school, because scholarships were not initially offered. Woullard has made friends with everyone he met at Jones and quickly began making his mark on campus. 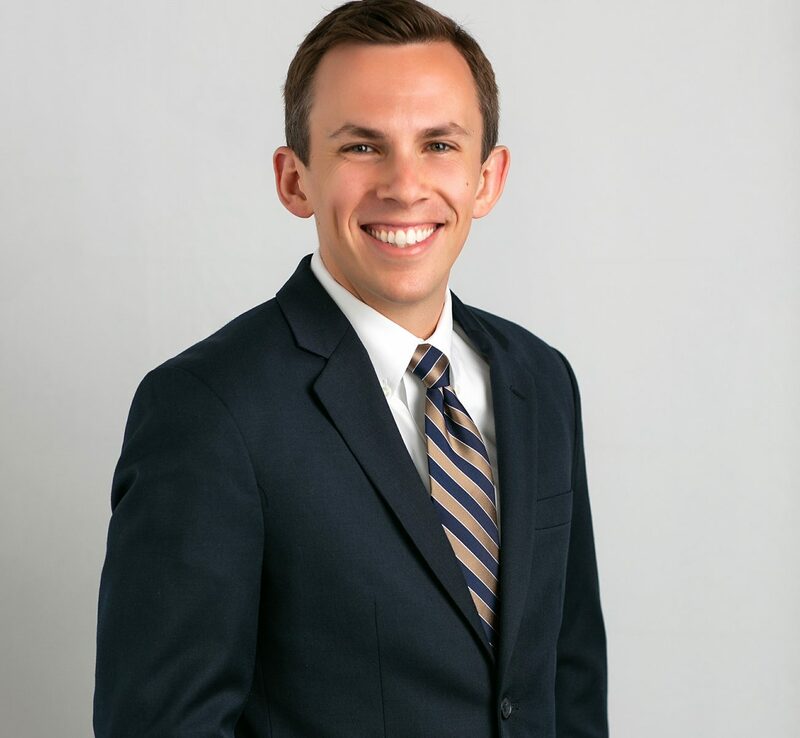 He has served as the Student Government Association president, Freshman Class President and is a member of the Presidential Student Advisory Task Force, Charles Pickering Honors Institute, Bobcat Brigade, Jones Concert Choir, Engineering Society club, Sigma Kappa Delta English honors society, and he was voted as Mr. JC. The Greene County native earned the Letter “J” Award and is a nominee for the All-MS Community College Team, while also holding a job as a “handy-man” for an apartment complex. “I want to thank everyone, faculty, staff, cafeteria and library employees; everybody has made this experience wholesome and a part of my heart forever! It’s given me the opportunity to be great,” said Woullard. Two future nurses were also selected as Tullos Scholars, Anna Catherine Hampton of Petal and Je’Shaiah Stephens of Laurel. Overcoming numerous household moves, including attending eight different schools, Stephens said it was hard to maintain good grades or retain information growing up. However, she continued to set lofty goals and began to see her work pay off. 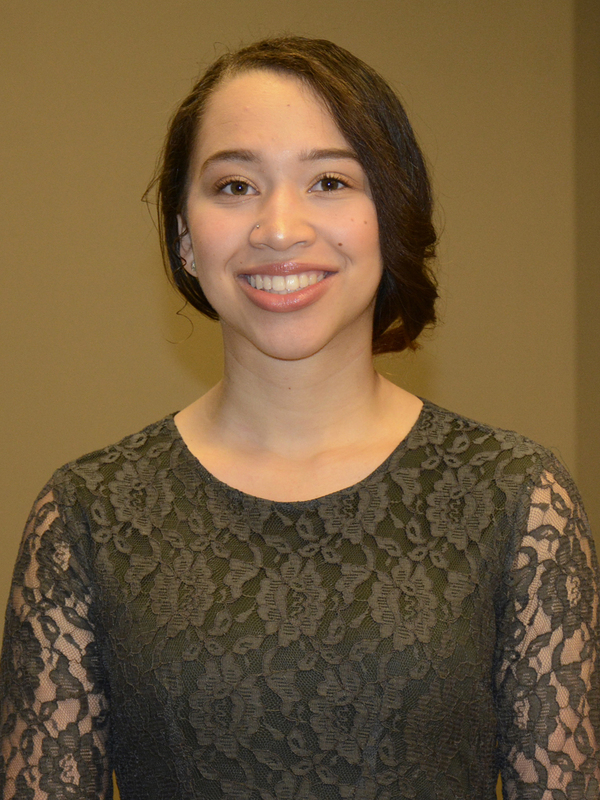 She enjoys being a PTK officer, a writer for the Radionian student newspaper, a reporter for “Bobcat Broadcast,” an English tutor, and she is a member of the English honor society, Sigma Kappa Delta and Bobcat Brigade. The South Jones High School graduate has earned Hall of Fame honors at Jones, and the Letter “J” Award, along with being nominated for the All-MS Community College Team. Being named a Tullos Scholar, Je’Shaiah said receiving such a prestigious honor is a testimony of how good and faithful God is in her life. “I am so thankful! This honor has reminded me to continue to work hard and make a difference in the lives of others. There’s power in our influence, and I hope through my hard work and determination, the encouragement that Mr. Tullos has bestowed upon me will not be in vain,” said Stephens. Stephens hopes to become a travel nurse and participate in medical missions. She is currently volunteering at 180 Ministries Youth Group, the Food Mission with Christ’s Church, the Media Department at her church and productions with REVEAL Ministries. Hampton shares Stephens’ belief that being selected as a Tullos Scholar is a reward for the many years of hard work and struggles. 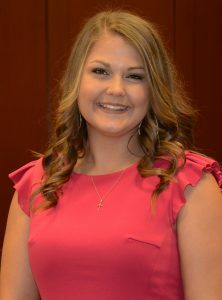 As a Tullos Scholar, Hampton said she realizes the many opportunities and responsibilities that come with the accolade. The Petal High School graduate aspires to follow her mother’s lead and become a nurse practitioner. At Jones, Hampton has been a member of the Charles Pickering Honors Institute, SGA, the Fellowship of Christian Athletes, Touch of Gold dancers, Bobcat Brigade and a manager for the band. She has served as the Sophomore Class President and has earned Hall of Fame honors while also volunteering at the Bobcat Student Pantry and the Petal High School Ministry Team at Carterville Baptist Church. Gene Tullos was a 1962 JCJC alumnus, a Bobcat basketball player, he was elected as Mr. JCJC in 1962 by his peers and he has served on the JCJC Foundation, Inc. Board from 2008 until 2016. Tullos was also named JCJC Honor Alumnus in 1999 and he was inducted into the JCJC Sports Hall of Fame in 2008 and into the Mississippi JUCO Sports Hall of Fame in 2009. ELLISVILLE – Mississippi’s 42nd State Auditor, Shad White will be returning to his home county to be the keynote speaker at both of Jones College’s Spring Commencement Ceremonies on Friday, May 3. The morning ceremony will begin at 10 a.m. for students whose last names begin with the letters “A” through “L” in the A.B. Howard/Bobcat Gymnasium. The second ceremony will be held at 1:30 p.m. for those students whose last names begin with letters “M” through “Z”. Both ceremonies can be viewed live on the JC web page, http://www.jcjc.edu/, and the Jones College Facebook page. Doors will open in the M.P. Bush Fine Arts Auditorium for overflow seating at 8:45 a.m. and 12:30 p.m. All guests will be screened for safety purposes with the gymnasium doors closing at 9:55 a.m. and 1:25 p.m., or when capacity is reached. About 670 students will participate in the ceremonies receiving either, an Associate in Arts degree, Associate in Applied Science degree, a Technical Certificate or a Career Certificate. Graduates and guests will hear from the Sandersville native who was appointed by Governor Phil Bryant to serve as State Auditor, last July. Previously, White has served as Director of Policy to then, Lt. Governor, Phil Bryant in 2011. He later practiced law in the private sector and served as a special prosecutor in Rankin County. While serving as the Director of the Mississippi Justice Institute, White filed and led cases against public officials when they violated Mississippi’s open government and ethics laws. The Jones County native continues to serve the state as State Auditor with the mission of protecting the public’s trust by verifying the funds provided by taxpayers to state and local governments are used in a legal and efficient manner for their intended purpose. “I’m thrilled to participate in this important day for the students and families of Jones College. It’s an honor to be invited to share in this milestone in their lives, and I look forward to sharing my thoughts about the future of our state and some lessons I learned on the road from being a college student to becoming State Auditor,” said White. 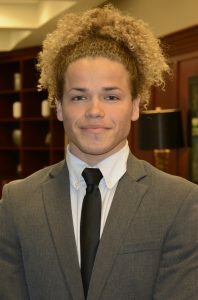 The Northeast Jones High School graduate continued his education at the University of Mississippi, earning a Bachelor of Arts degree in economics and political science, where he was selected for the prestigious, national, Truman Scholarship. As a Rhodes Scholar at the University of Oxford, White earned his Master’s in economic and social history before earning his Juris Doctorate degree from Harvard Law School. Additionally, White has taught as an adjunct professor at the University of North Carolina at Charlotte. White and his wife, Rina and their daughter, Zara live in Rankin County and are members of St. Richard Church.